Old Dominion Ham Biscuits: Ask any savvy host in the South what the most popular special occasion menu item is and you’ll likely get one answer – the Ham Biscuit. Take notice and you’ll find them everywhere. They’ll show up at tailgating and football parties, on the holiday cocktail circuit, with breakfast, on the brunch buffet, for New Year’s Eve and again on New Year’s Day. Old Dominion Ham Biscuits have maintained an extraordinary importance on the Southern table simply because they taste great and they’re easy to make. No matter what the occasion, casual or elegant, they fit right in. There are rules for making truly exceptional Old Dominion Biscuits. 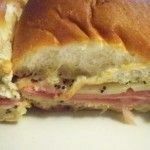 This recipe comes from Virginia (that’s why they are called Old Dominion), and they are a little more sophisticated than the traditional Ham Biscuit. 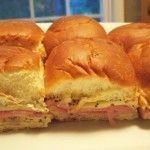 The flavored butter spread, with poppy seeds, Worcestershire sauce, Dijon mustard and grated onions, adds just the right amount of flavor to make these Old Dominion Ham Biscuits stand out above all the rest. Even my husband who grew up on the traditional Biscuit, thinks these are amazing. 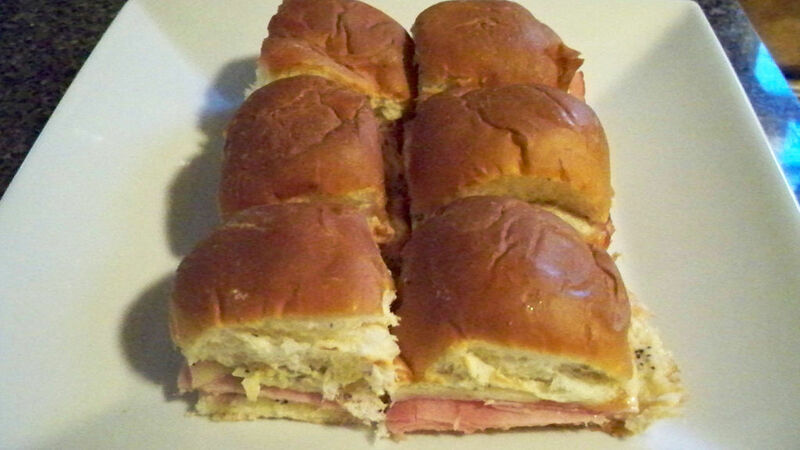 I like to use King Hawaiian, Hawaiian Sweet Rolls when making these Ham Biscuits. The sweet rolls add in a new dimension to the Old Dominion Biscuits, and they are the perfect size for munching. Preheat oven to 400°. Leave rolls in pan. Slice off top half of rolls and place beside pan. Combine butter with next 4 ingredients and spread on inside of top and bottom of rolls. 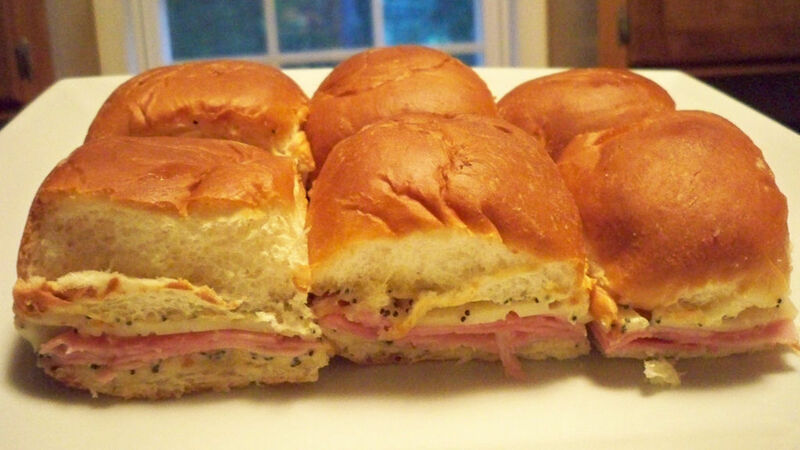 Layer ham and cheese on bottom half of rolls, replace top half of rolls, and wrap in foil. Bake 15 minutes or until cheese melts. Using a sharp knife, separate rolls and serve warm. 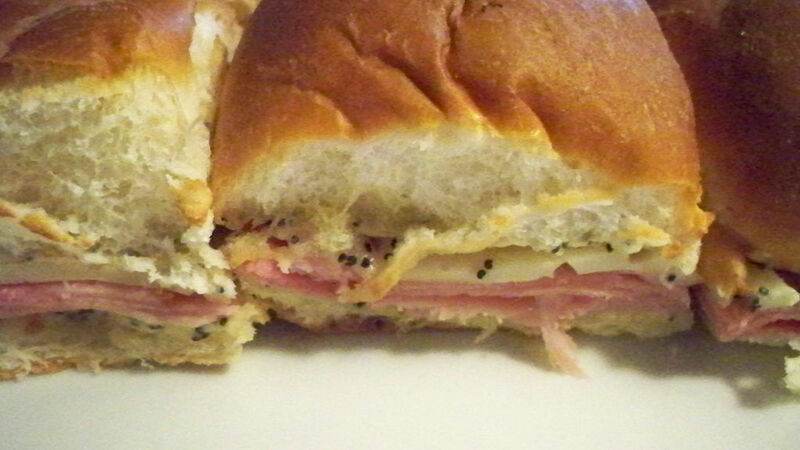 I like to use King Hawaiian, Hawaiian Sweet Rolls when making these Ham Biscuits. The sweet rolls add in a new dimension to the Old Dominion Biscuits, and they are the perfect size for munching. Brooke I’m headed back to Roanoke this weekend from down here in Bluffton, SC for my family reunion, so these will be a perfect item to take to the picnic up on the Peaks of Otter. Thanks for the perfect recipe at just the right time. I went to school with Willa, so I’m thrilled she shared your webpage with all of us!! I’m walking off with this THW recipe!! Hawaiian rolls are not biscuits, they’re rolls.They also aren’t Southern. Huge difference and not interchangeable. No self respecting Southern hostess would serve her guests packaged party rolls and call them biscuits. I realize that the rolls are not biscuits, or Southern for that matter. Maybe I should call them ham rolls to be more accurate. I found this recipe in a Virginia cookbook, and adapted it a bit for my own taste and ease of making large quantities. I’ve had ham biscuits several times before, either at cafes or served at a party, and they have never been on a true biscuit. Always some sort of roll. I like to use the Hawaiian rolls for several reasons. I think the sweet taste works amazing with the the ham and the butter spread. I also like to use them when making large amounts for parties, because of their size and how they are sold. 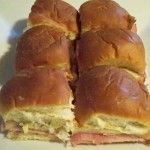 You can buy a couple packages of them, easily cut the all the rolls in half at once, build you ham biscuits and be done without too much mess or effort. Also, I came up with the idea to use them, because my mother-in-law, who is from the South, makes her ham biscuits that way. Feel free to make yours with homemade biscuits if you prefer. I am a “self respecting Southern hostess” and love these ham “biscuits”. I, too, use the Hawaiian rolls because of the sweetness and I like the texture and softness of the roll. I serve these when having large groups of family and friends and my guests love them! Here in the south, we are not so uptight as to worry about whether they are called rolls or biscuits and we do know the difference! So thanks for posting this recipe and keep up the good work!